We produce for Italy and abroad travels and souvenirs molds from the world. 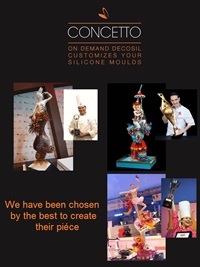 Italian leaders of silicone moulds, we create and sell for over 10 years travels and souvenirs molds from the world, food safe silicone moulds worldwide to confectioners, bakeries and Delicatessens. Silicone molds inspired by travels, monuments and souvenirs from all over the world. Why do we propose this new line of molds dedicated to souvenirs? The silicone molds designed for chocolate souvenirs to be given to friends and relatives when you come back from a trip is a new idea by decosil 2017. It should instead become sweet a souvenir to share at table. the windmill and the wooden clogs for the Netherlands and molds of items recalling Las Vegas Casinos, the lighthouse you can find in any seaside location. CONCETTO is a package service which decosil makes available and it is designed for the production of customized molds as to shape and size. In this way you can obtain objects not yet included in our catalog.